The message that “Christ is Risen” reverberates around the world at Easter. Christians everywhere celebrate. 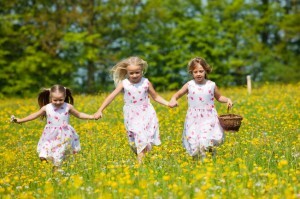 Springtime celebrations are great fun for young children, with egg hunts, candy and cousins abounding. Adults also enjoy the fun, but sometimes our teens and older tweens are just along for the ride. How can you make your Easter time celebration more fun and rewarding for them? I have two suggestions: include them as adults, but also plan some age specific activities for them. Include your teens and older tweens as adult partners in planning and executing your celebration. By including them as your partners, you are acknowledging their maturity and showing that you trust their abilities and judgment. Although they may consider themselves too mature and sophisticated to hunt eggs, they may enjoy hiding them and helping the younger kids with their hunt. Perhaps they can take over the job of coordinating the dying of the eggs, or the filling of the Easter baskets for you. Let them lead the home and table decorating activities – coming up with ideas, researching costs, conferring with you and then making the decorations happen on the event day. Let them start to pass along the family traditions to their younger relatives, explaining and demonstrating what your family does and why. Take advantage of the holiday to pass along some financial lessons. Sit down with your teen or tween and plan out your Easter expenses – let them fill in the spring holiday budget for you and then track it. Send them on a hunt for average prices then enlist them to help you find bargains or ways to reuse or create items instead of buying them. They can scour the internet to find frugal ways to serve the meal, or decorate the house or make and fill the baskets. Ask them to observe this year’s celebration and make suggestions on how to do it better or less expensively next time. Use the occasion to let them practice their spiritual values. Keep the focus on the reason for the holiday. Teens and older tweens will appreciate being included on a more adult level. Suggest that they plan a philanthropic event to raise money to donate to one of the causes they care about. Help them develop a budget, come up with money raising ideas, and locate the recipients of their generosity. Show them how to enlist the aid of other adults or organizations. Make sure they have the chance to actively participate in your religious activities. Plan something special for just them. Although they want to be recognized as mature and independent people, they really are still kids, so don’t forget to plan some special fun for them. After the little kids have their hunt, make sure that you fill some plastic eggs with coins, bills or other items desirable to this age group. A hunt for THE egg with the $10 bill in it can become quite passionate! Everyday Life website has some ideas on their post Easter Egg Hunt Ideas for Teenagers. Make the hunt a learning game. Establish a prize that all of the older tweens and teens in your party will long to receive. Type out questions that they will have to answer or find the answer to in a book or on the net. The first one to get all the answers done correctly wins the prize. You could make this a financial literacy learning event by making the questions be related to saving, investing, borrowing or other financial type concepts. You could have some of the questions require a few minutes of research – such as finding the current PE for a certain stock, or locating a local bank with the highest account interest rate. Suggest a youth group springtime activity. If your teen or tween belongs to a church group or scouting group or other youth group, get together with the leaders and come up with some kind of group activity that takes advantage of springtime – whether that is a fund raising window washing event or an overnight camp out in the nature preserve cabins, they will enjoy the opportunity to be among their own age group without the rest of your family there! What teen and tween activities have you done at Easter time with your family?